MIPIM MIPCOM MIPTV LIONS DUTY FREE. Located in Cannes on Boulevard de la Croisette between the Hotel Martinez and Port Canto. 7th floor (top floor) with panoramic view of Cannes. Big loggia south exposition. The beach is across the road. twin beds which can be used as twins or reunited to form a 160cm king size bed , 1 sofabed (1.60m), 2 dining tables, 2 wardrobes, TV,HI-FI, armchair, chairs, dresser, coffee table, deck chairs, umbrellas, mattresses for the beach, beach rackets, plastic boules etc. Air conditioning in the lounge & in the bedroom. There is a locked garage in the vicinity for medium/small cars. Supermarket, bakery, rotisserie, for the sporty (by car) golf club, ski nautique, fishing sailing.. The bathroom is entirely tiled in marble With a small window. There is a bath with a double shower, (big fixed shower head and flexible smaller head) there is a sink in a bathroom cabinet, a mirror cabinet, a mirror, a socket for hair dryer(provided). The toilet is separate with a little sink and a window. There is an independent kitchen, well equipped with a window opening on the terrace which is big enough to sit 4 to 8 people +2 relax chairs there is another dining table in the lounge which can be a coffee table as well (height adjustable). there is a sofa bed .a wardrobe and everything for cooking Marble on the floor and on the terrace from where you get a panoramic view 'imprenable' as we are on the 7 th and top floor and being south facing you follow the sun the whole day. We enjoyed our stay at Cannes and the apartment was amazing, very good comfort and lovely view. Good service and good facilities at the apartment. Another fantastic holiday, congratulations on the apartment improvements, and thank you for the bottle of wine on our arrival. Very good shower facilities, and the new sink unit is great, especially with the additional lighting. My wife especially liked the new bedroom lighting as she reads a lot and found them really useful, and the electric shutters very good too. Kitchen upgrade extremely good, love the new Bosch oven, so versatile, and the new units, granite work top and tap very good too. Made full use of the portable fan to help cool us down, it was in the mid 30's on the balcony from mid day to early evening, then went for a swim, air con in booth rooms very good too. Toilet change round a definite improvement, and found the apartment very clean and tidy, and very well organised as well. We have met the managing agent and found her a very pleasant and friendly person, I hope she continues for many years to come. Friendly owner and easy communication. Very good location, fantastic view overlooking the the port, the beaches, actually the whole bay from the loggia. Restaurants, shops, supermarket, train station are within a walking distance, very good public beach is just across the road. Spacious apartment (enough space for 2 adults and 2 children), very well furnished and convenient, both bedrooms have air conditioning. All in all we had a wonderful stay. Definitely recommended. This is a superb apartment in a stunning position! Everything that could possibly be needed is provided; it doesn't matter too much if the weather isn't perfect - although it usually is - because this is a wonderful base to relax and just watch the world go by! We would recommend it to anyone and intend to return as often as we can! Stayed in this apartment with my adult niece - she used the sofa bed and I had the bedroom. We absolutely loved it and would definitely stay there again. The building is quiet and secure (and the quirky, forest-themed lobby decoration made us laugh!) The apartment is small, but light, airy and extremely well maintained. Everything was spotlessly clean and in perfect working order, which is exactly what one wants in a holiday rental. The decor is tasteful and neutral, and we loved the French windows that opened from living room and bedroom onto the street below. The loo is separate from the bathroom, which is a big plus in my book! We were welcomed by Eugenio, who was very helpful and informative. When we left, he kindly organised a taxi for us. The metro station is a few minutes' walk, so it's convenient for visiting the major sights, which are all in the centre of the city (apart from Sacre Coeur, which is a short - but steep - 10 minute walk from the apartment). But actually the best thing of all, for us, was the neighbourhood. I have stayed in Paris many times, but never in this district. There were so many great restaurants and bars right on our doorstep and a lovely, relaxed buzz in the streets in the evenings. It was never too noisy or rowdy though - just right for us two women, one 50+ and the other in her mid-twenties. This was the best Paris apartment and neighbourhood I've stayed in. I'd recommend it to anyone! Second time we have stayed here, and loved every minute of it. 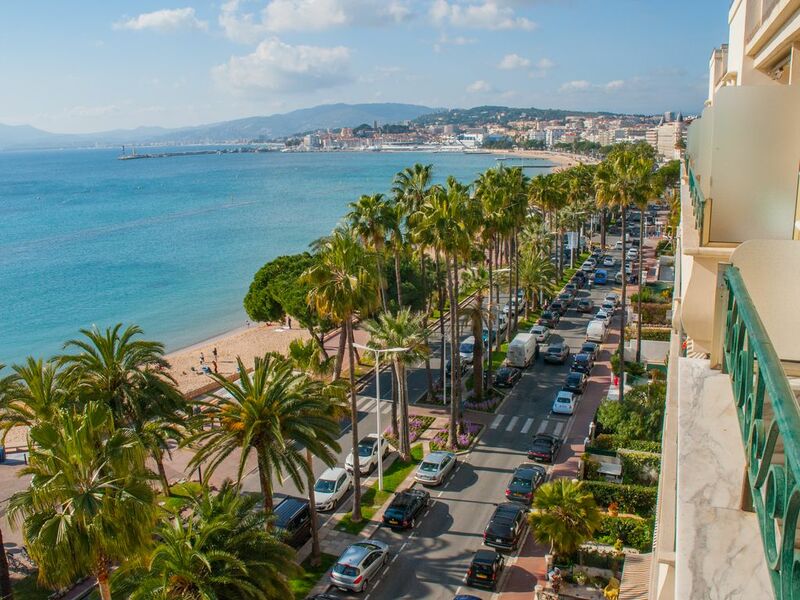 Cannes is a beautiful place to come on holiday to, and to stay in this apartment makes our holiday even more enjoyable, the view is incredible. Booking the apartment with Nicole is never any problem, and her agent there was very obliging. We find this the perfect place to come and relax, enjoy our time together, soak up the atmosphere, and soak up the sunshine! There is not much more I can add to this and my previous review, other than to say we would come twice a year if our work schedules permitted. Thanks Nicole, we will be back again next year! !